Neptune’s became the world’s first all-female Royal Life Saving Club to both perform regular patrols and have its own permanent club house. The first Australian branch of the Royal Life Saving Society (RLSS) was formed in Sydney in 1894. At a conference held in Melbourne in July 1938 it was decided that the Surf Life Saving Association (SLSA) would patrol all surf beaches around Australia, while the RLSS would patrol all still and inland waters such as bays, rivers and pools. Encouraged and supported by Frank Venning, an early champion of the RLSS in Queensland, a group of ladies with an interest in athletics established themselves at the Brisbane Gymnasium under the tutorage of instructor Joe Bett’s. They incorporated regular visits to the Ithaca Baths into their fitness program, which further fuelled their interest in water safety and lifesaving. The Neptune Ladies Life Saving Club, named by Frank Venning in honour of his former swimming club in London, was formed in 1928. In 1931 they included ‘swimming’ in their name and officially became the Neptune Ladies Life Saving and Swimming Club. The first office holders of the new club were Mrs W. Soden as president, Miss A. Sommerville as secretary and Miss J. McGregor- Lowndes as captain and treasurer. Fund raising was undertaken through a series of social events and dances. The Neptune Club members initially trained, acted as life guards at community pools and provided lifesaving instruction. It was a common attitude of the time that women lacked sufficient strength and stamina to competently operate lifesaving equipment or perform rescues in heavy surf. As a result, women were banned from qualifying for the surf bronze medallion and therefore excluded from patrolling beaches. Despite the challenges, the ladies from the Neptune Club persevered and made many appearances at surf lifesaving carnivals in Queensland and interstate. These events included participating in a ladies surf carnival at Mooloolaba in 1930, a non-competitive display in the march past at the Point Danger Branch’s 1931 championship carnival and sending a team to the Royal Life Saving Championships in Adelaide in December 1936 wearing their wide striped costumes of maroon and white. In 1948, Point Danger refused a request from Tugun to loan the Neptunes lifesaving gear. The reason for the refusal was that equipment could only be loaned to qualified life savers. During the same period, the Neptunes asked Tugun permission to hold the first ladies surf carnival since before the war on their beach. While waiting for permission the president, Miss Jess Clarke, told journalists that she would hold the event anyway and gift any money raised to Tugun to help fund a new surf boat. The Neptune’s courted considerable controversy in 1949 by staging a display on Tugun beach ‘without authority’, followed by an interview on radio by a club member who criticised the Surf Life Saving Association for its attitude to female life savers. The result was the lodgement of an official complaint by the SLSA. The Neptune Ladies Life Saving Club began patrolling the waters of Tallebudgera Creek, on the eastern side of the highway bridge, in 1959. Increasing numbers of visitors to the nearby National Fitness Camp and Tallebudgera Caravan Park made the area, which was subject to dangerous tidal surges, a popular bathing spot. Ten girls would travel by bus down from Brisbane to set up the surf patrol. During the evening they slept by the foreshore in a tent and often cooked their meals by camp fire. 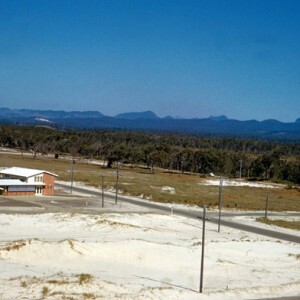 In 1960 a portion of land was allocated by the Queensland State Government for the purpose of building a club house. 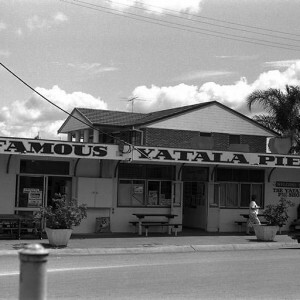 Local residents and community groups supplemented the funds raised by club members and volunteers and a single story club house was built on the site and officially opened in 1961. Neptune’s became the world’s first all-female Royal Life Saving Club to both perform regular patrols and have its own permanent club house. Members were required to train twice a week and perform six hour patrol shifts. 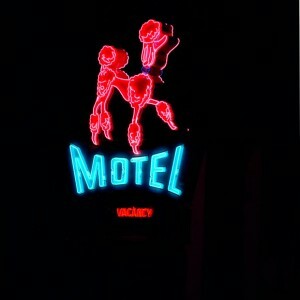 To raise funds for the club the members worked the cloak room of an evening at the adjacent nightclub, The Playroom, from 6pm-6am. The club had a close relationship with Beryl Carnell, who took over running the nightclub with her son after the death of her husband Claude. Beryl and her Playroom staff were always on hand to help out if the ladies experienced any trouble around the club house of an evening. In 1980 the ALSA agreed to accept women into its all-male lifesaving clubs, Neptune’s being one of the first six female teams to gain the surf bronze medallion. They reciprocated in return and began to accept male membership. The club house has since been remodelled three times and is now a double story structure with dormitory style accommodation. Over their long history Neptune life savers have completed thousands of rescues and emergency first-aid treatments. Winders, J.R. Surf Life Saving in Queensland: a historical record of surf lifesaving in Queensland. South Brisbane: Council of the Queensland State Centre of the SLSAA, 1970. 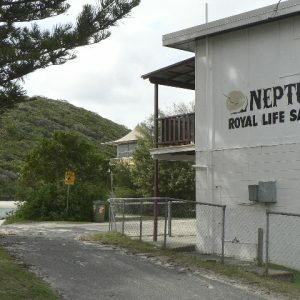 Neptune pioneers ruled the roost (2006, November 21) Gold Coast Bulletin, p. 6.
https://soundcloud.com/abc-gold-coast/trailblazers-neptune-ladies-royal-life-saving-club-at-tallebudgera-creek-gold-coast Accessed 22 September 2017.
https://digitalbank.goldcoast.qld.gov.au/vital/access/manager/Repository/vital:20762?query=neptune Accessed 22 September 2017.
https://en.wikipedia.org/wiki/Royal_Life_Saving_Society_Australia Accessed 25 September 2017.
http://neptunerlsc.com.au/our-club Accessed 9 August 2017.
http://www.nma.gov.au/exhibitions/between_the_flags/the_birth_of_surf_lifesaving Accessed 22 September 2017.